Medium - $96.99 Only 3 left! Large - $96.99 Only 5 left! X-Large - $96.99 Only 1 left! Halloween invites all sorts of fanfare and arguments over favorite characters and pastimes. We believe that we all, however, can agree on one simple fact: one of the top-five scariest things that can happen on the holiday remains sudden movement by a once-thought inanimate (and thus immobile) Spooky Thing. Right? Right. 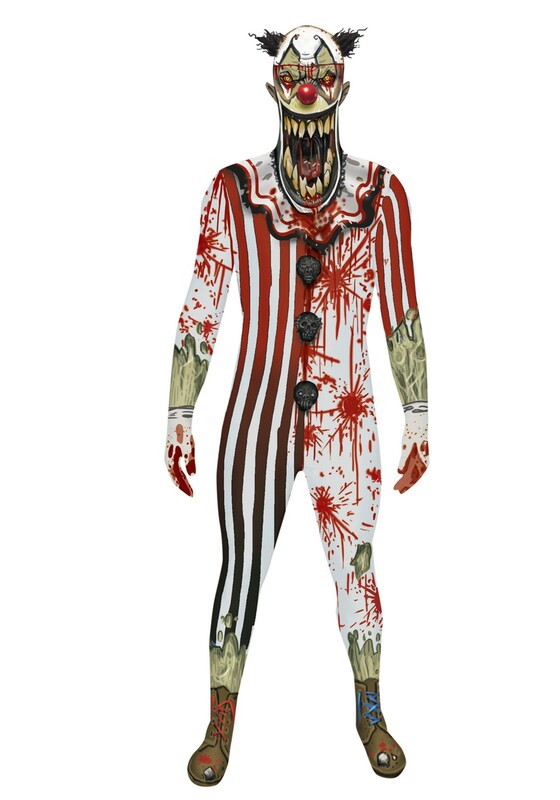 Well, we believe that's what makes our Adult Scary Clown Jaw Dropper Morphsuit one of the freakiest items of clothing one could wear this Halloween. Something about that hellish circus look just really lends itself to that sort of slow-turn or jump-scare. It's a one-piece nightmare for anyone antsy to conveniently post up on the lawn or in your local haunted house waiting to scare the senses out of anyone foolish enough to get close. No one wants to walk up a driveway with that jaw in their periphery, and somehow fewer want to see that jaw slowly follow them on their short journey to acquire candy. Right? Right. So this year, fully immerse yourself in becoming that clown from Hades with this one piece jumpsuit. The material has plenty of stretch to it so when you decide to jerk into motion as those unsuspecting Halloween revelers pass by there won't be any worry of stiff seams and buttons getting in the way of a good scare. Crouching behind a wall has never been easier than in this macabre polyesther and spandex suit. Simply zip up and head out. Tonight, the scares are on you!